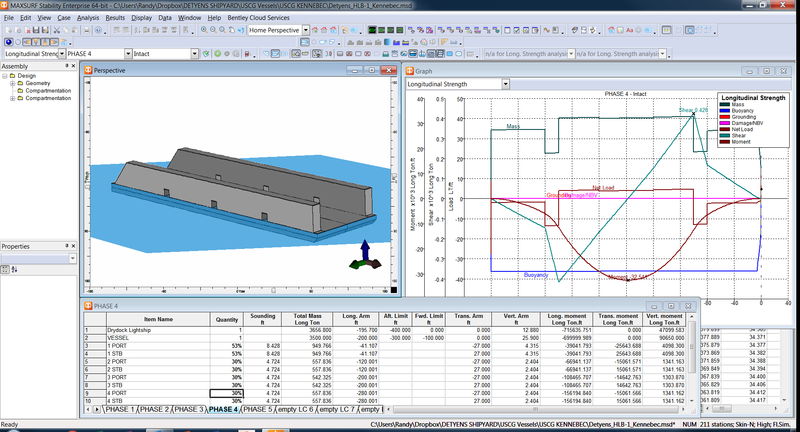 The MAXSURF Stability module provides fast, graphical, and interactive calculation of intact and damaged stability and strength for all types of MAXSURF designs. Once a design has been created using Modeler, its stability and strength characteristics can be assessed using the Stability analysis module. The Stability analysis module provides a range of powerful analysis capabilities to handle all types of stability and strength calculations. Precise calculations are performed directly from the dynamically trimmed NURB surface model without the need for offsets, command line hydrostatic programs, or batch file preparation. 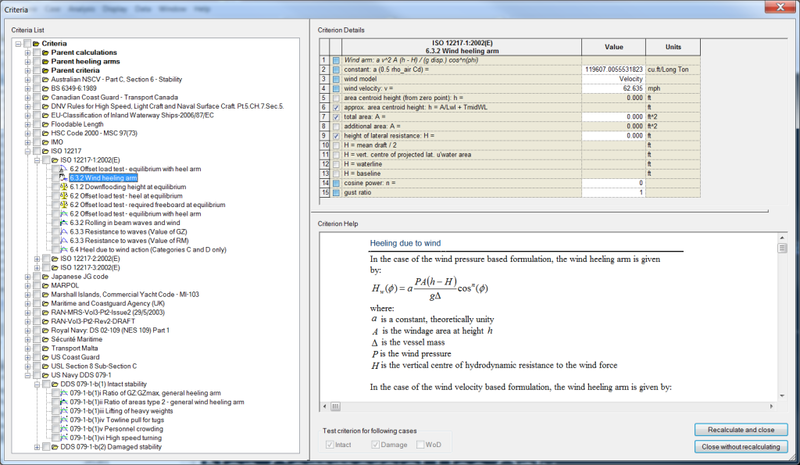 MAXSURF Stability also provides the ability to perform multiple analyses in one step with a very simple set-up window. To watch Bentley Systems’ Head of Product Development present an 8 minute educational overview and demo of MAXSURF Stability, Click this link. To watch our Maxsurf Stability Demo of Equilibrium, Hydrostatics, Large Angle Stability, Floodable Length, and Longitudinal Strength, Click this link. 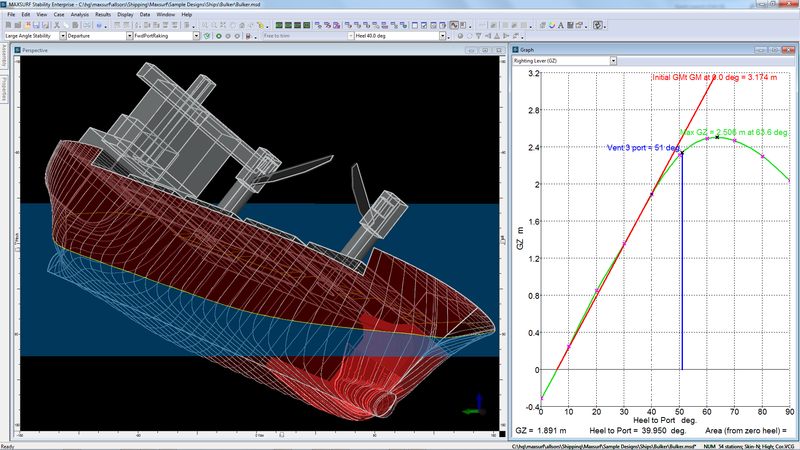 Click this link to see our Maxsurf Stability demo performing an Equilibrium Analysis of a Crane/Deck Barge. 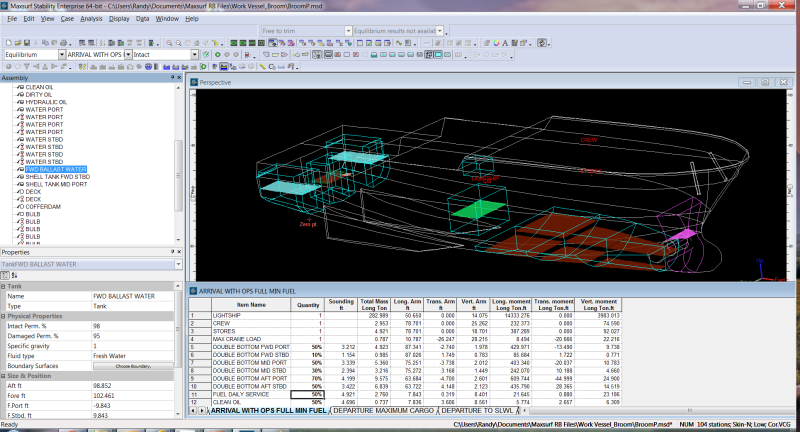 An Integrated Load Case Editor makes setting up any number of loading conditions simple and error free. Copying and pasting data to and from spreadsheets also makes it easy to prepare complex loading schedules in other programs and run them in Stability. Load cases can also be saved and reused with various design configurations. 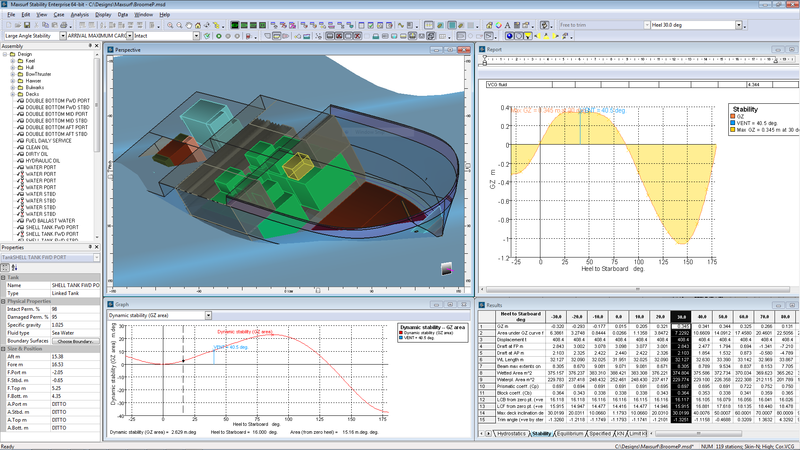 Tank and Compartment Modeling are integrated within Stability, allowing you to quickly and easily define the vessel’s tank and compartment layout. More complex compartments can be defined using surfaces created in MAXSURF Modeler. 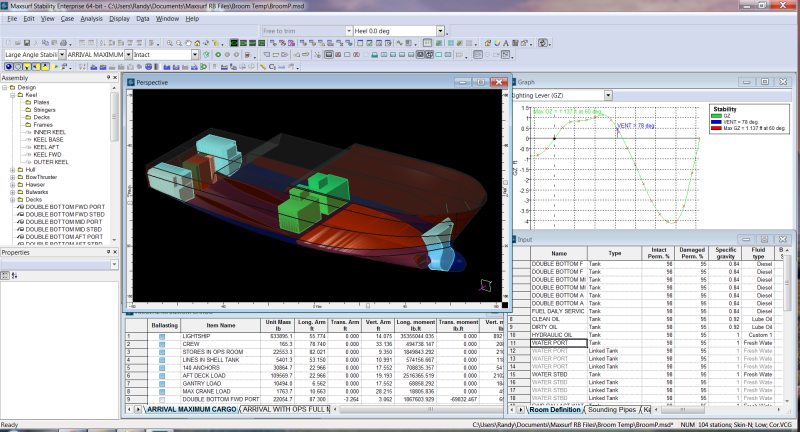 Tanks are automatically included in the weight schedule and as parametric objects they are automatically updated if the hull shape is changed as the design progresses. A tank calibration option is provided to give detailed volume and CG characteristics of all tanks. The MAXSURF Stability module includes intact and damaged options (including Probabilistic Damage and MARPOL Oil Outflow) for a wide range of analyses including upright hydrostatics, Large Angle Stability, Equilibrium Analysis, Floodable Length, KN tables (Cross Curves), Limiting KG, and Longitudinal Strength analysis. For each analysis method, Stability automatically highlights the required data to be entered and provides data entry dialogs to ensure data is entered correctly. MAXSURF Stability provides a wide range of Stability Criteria, including the most commonly used standard criteria, that can be used to ensure compliance with class requirements. The software also allows you to define your own custom criteria for special requirements. When used in conjunction with the table of downflooding points, it provides a complete range of options for satisfying class. After an analysis is completed, all results are presented in either tabular or graphical form. You can click on any graph and move the cursor to obtain precise values at any location. You can also choose how tables are displayed, which columns are visible, and sort results by any column. An automatically formatted on-screen report window accumulates the results of analysis to help prepare a stability book for your vessel. Descriptions, tables, graphics, and graphs are automatically inserted and can be re-formatted or deleted at any time. You can also enter notes into the report and cut and paste graphics from the Stability module, other Maxsurf modules, or any other program. The entire report can be generated using a Microsoft Word template. 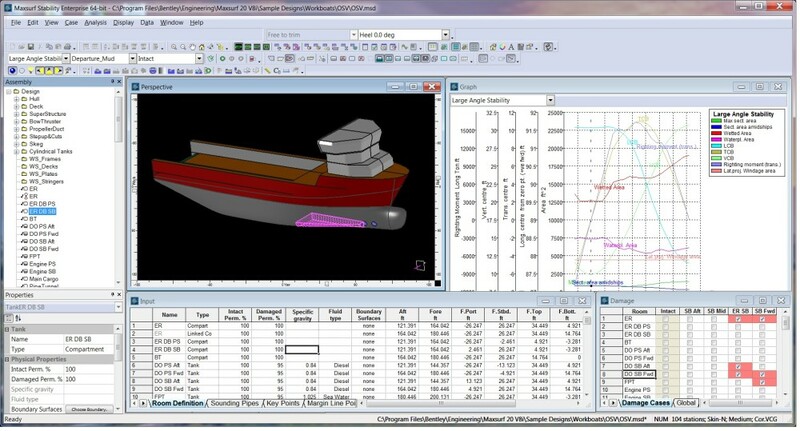 The wide range of analysis, data entry, and data display options within MAXSURF Stability make it an indispensable tool for designers of all types of vessels. 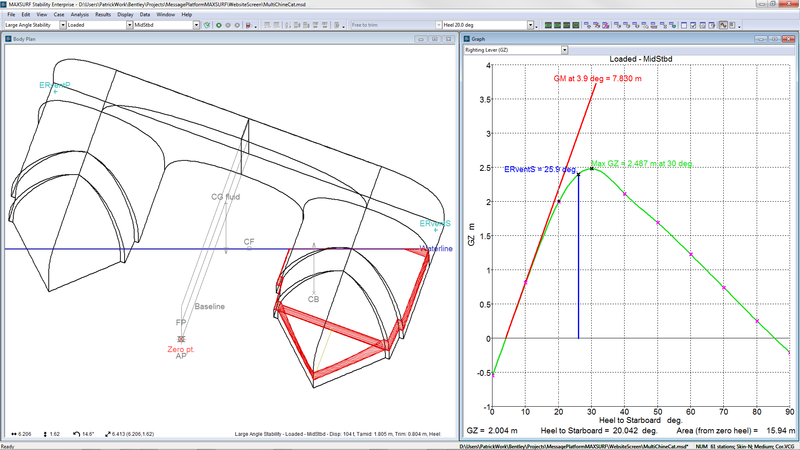 For designers with a limited budget, the basic Stability module contains only the intact hydrostatics and large angle stability analysis methods. 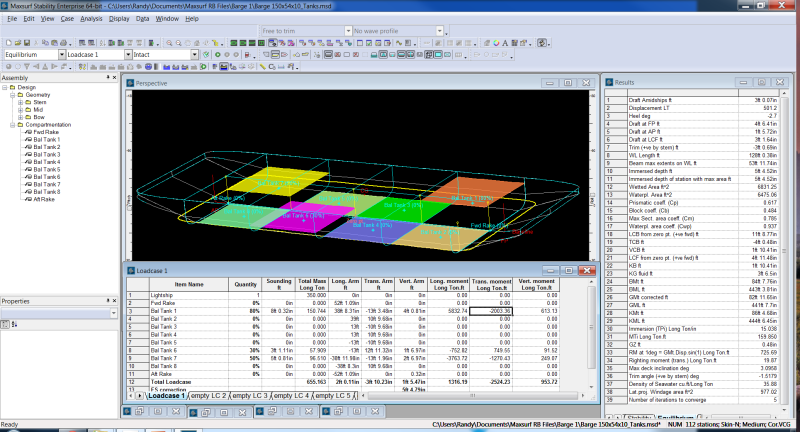 Stability features included in the MAXSURF Advanced Suite adds tank definitions and calibration, stability criteria, damage stability, longitudinal strength, limiting KG, floodable length, and MARPOL Oil Outflow, while Stability features included with the MAXSURF Enterprise Suite adds Probabilistic Damage Stability. No Command Lines to remember or program in the correct order (you are a Naval Architect, not a computer programmer). surface integration of the MAXSURF NURBS model. 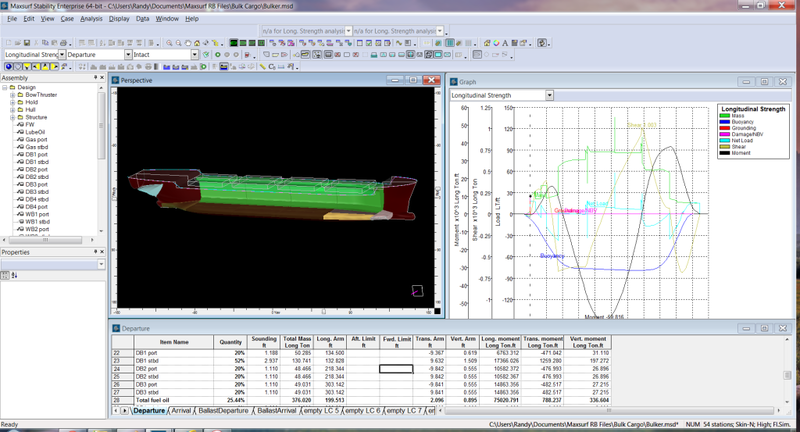 Visualize hydrostatic behavior in real time while analysis runs. Ensure accurate load cases with automatically linked tanks. Analyze any hydrostatic condition with comprehensive analysis capabilities.